North Ayrshire Table Tennis Club held the 4th North Ayrshire Open at St Matthews Academy at the weekend which saw over 155 players from all over UK travel here to compete. There were 15 different categories for players to compete in, ranging from u11’s to over 55’s. We had 25 North Ayrshire players competing which saw some great results posted by the players. Andy Macpherson & Richard Main both reached the latter stages of the Mens Singles, with Andy reaching the last 16 & Richard losing out in the Quarter Finals to the top seed & eventual winner Chris Wheeler. Jill Taylor reached the last 16 of the Womens Singles where she lost out 3-0 to Holly Williams of Swerve TTC (Middlesbrough). Garnock Valleys TTC & St Matthews Academy pupil Rebecca Plaistow showed how much she has improved recently with reaching the final of the Women’s Singles & justified her top seed in Junior Girls winning that in dominate style too. 1 win over Rafael Wolowski (Aberdeen) in the final. Jamie beat Stanley Loi (Aberdeen) 3-0 in the u11’s final which made it a double win for the brothers from Stevenston. Martin reached the final of u15 boys with 2 solid wins over James Forrest & Zaid Khalid. Ryan Watt & Holly McNamara did brilliantly in their age categories, Holly reached the SF of U13 Girls & Ryan made his way to the SF of U11 Boys losing out to club mate Jamie Johnson. Ryan Henry, Robin Wilson & Derrin Lynch successfully qualified from their groups and into the knockout stages of Junior Boys event where they all lost out to top seeds. 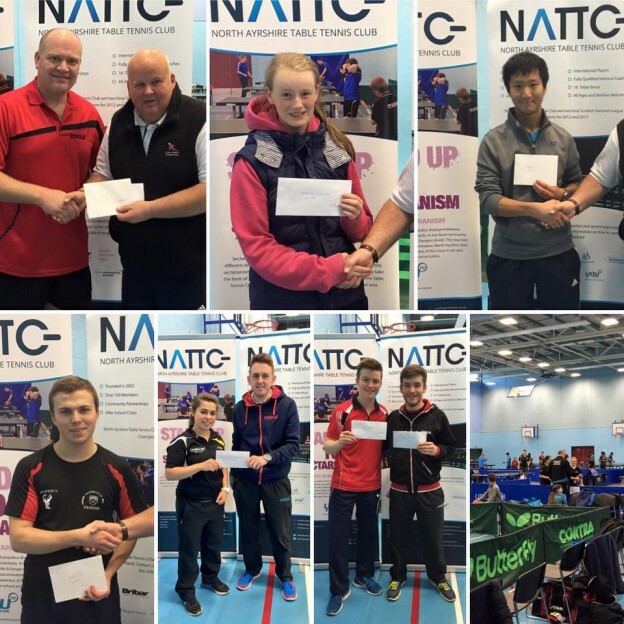 The North Ayrshire Open is developing into one of the biggest & most prestigious table tennis events in Scotland & NATTC hope to build on that and keep making it bigger & better each year. This entry was posted in Latest News on 30th November 2015 by Chris Main.